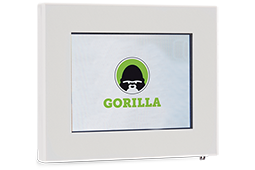 The Aviator touchscreen controller is designed to manage a mini-network of Gorilla X HVLS Fans. This multi-fan control system features a wall mounted 9cm LCD touchscreen display that communicates to each fan individually from a central location. It can alter the fan speed in real time by simply changing up or down the percentage value on the display. Each fan can be individually turned on or off by touching the relevant power button icon. The controller is particularly suitable for sports centres and working environments where the Gorilla HVLS fans are required to operate to a set time.